What do Primrose Hill and Camden Look like? The character of the NW1 postcode is rather varied compared to other parts on London. You will find the busy high street flats in Camden, houseboats in the Camden Lock, very affluent households around Primrose Hill and even some council housing. 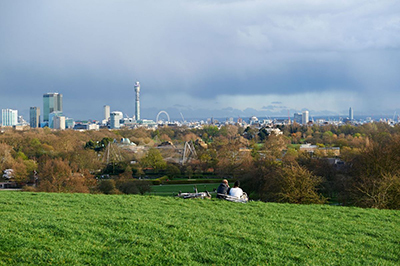 Primrose Hill is made up of a combination of larger single occupancy houses with three and more bedrooms and wealthier inhabitants while Camden will allow for targetting of a younger demographic. Younger is still a relative term since the largest demographic in NW1 is the 30-44 year-olds. The average household income in NW1 is considerably larger than the London average. You will find the difference to be around 25%. This is a rather high income when compared to the UK average income as a whole. This is demonstrated by the fact that approximately 65% of the households in this postcode are in the A,B or C1 social grade. We at The Private Postman specialise in cost-effective leaflet distribution to affluent parts of London. As a consequence NW1 is one of our main postcodes and we deliver to a significant part of it on weekly basis. Our leaflet distributors are very well acquainted with this area and some of the even live locally. Some of the more famous people that have lived in this area include Kate Moss, Amy Winehouse or Charles Dickens. Camden specifically houses some of the most famous of London musical venues. The Electric Ballroom, Ronnie Scott's Jazz Club and Camden Roundhouse are only some of the amazing places to go see live music in the North West 1 posctode. Another fact to keep in mind about leaflet distribution in NW1 is that only about 20% of households in this postcode have children. The more typical demographic in this area is a one person household with the individual in a managerial or a professional position. Around fifty percent of the households fit into this description. With that said we would advise to not overlook the 30% of households that are occupied by married couples. We can help you break down and explain which neighbourhoods will be more effective to target with your leaflet distribution campaign. As most areas in North-West London we have invested a considerable amount of time into mapping out the individual parts of each postcode. Through that we have developed a deep understanding of the demographic all over the affluent London areas. We use this knowledge to advise our clients that range a wide variety of industries and sectors. As per usual we exclude all council housing and businesses from our mapping system and numbers. This allows us to run the mos cost-effective service possible. In the postcode we are discussing this move will remove around one fourth of all households. As a result of the level of variety in this postcode together with some challenges relating to the terrain these areas can be challenging to distribute flyers to. Our gps tracking system helps us asses if our distributors are being effective when it come to delivering to all households outlined. This combined with the training that all of our workers get makes sure that none of your leaflets are wasted. We at The Private Postman make sure to not deliver in the rain or snow and we do not fold your leaflets. This means that you will reach your whole local market while your leaflets are delivered in the best shape possible.